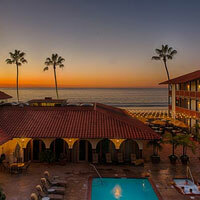 Located within the hacienda-style La Jolla Shores Hotel, The Shores shares a celebrated reputation with the three-story, Spanish-style hotel property. Beachside views and a laid-back, family-friendly vibe complement freshly-prepared dishes, a happening happy hour, and a California coastal-inspired menu-land and sea. Under the culinary craftsmanship of Executive Chef Bernard Guillas and Chef de Cuisine Percy Oani, The Shores Restaurant continues to live up to the hype as one of the best restaurants in La Jolla. Our award-winning menu has a mix of seasonal and local selections using Southern California's year-round fresh produce for high-quality flavors.